Peugeot RC Hymotion | What Car? Peugeot has been ploughing the RC concept furrow for some time now, with the first cars in the line appearing in 2002. This latest is called the RC Hymotion 4 and is the clearest signal yet of the shape of future Peugeots. It gives an excellent idea of what the replacement for the aged 407 family car will look like when it arrives in 2009 or 2010. It moves on from the large, basking shark-style grille of current Peugeots and points to a sleeker future. The four-seat concept car at the show is powered by a 313bhp petrol hybrid combination, with 95bhp provided by the electric motor and the rest from the 1.6-litre engine. It also has four-wheel-drive, and travels from 0-62mph in 4.4secs, yet manages CO2 emissions of just 109g/km. That doesn't limbo the magic 100g/km benchmark which earns free road tax, but for a engine with that much power it's impressively low. Peugeot also unveiled the Prologue, a concept car that will go on sale next year as the 3008 crossover. Combining 4x4 and MPV styling, the car is described by Peugeot as being 'derived from the fusion of different worlds'. Hmmm. Although the concept car is powered by a hybrid drivetrain, which is also called Hymotion 4, this version uses a 163bhp 2.0-litre diesel engine. It has four-wheel drive, with 37bhp electric motors driving the rear wheels and the engine driving the front wheels when required to do so. Carbon dioxide emissions are an average of 109g/km. 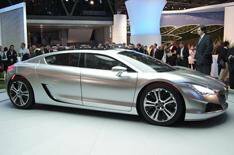 However, the production 3008 will go on sale with conventional engines only initially.